The Phillies had a chance to win it in the 10th but Jean Segura, the hero of Sunday's 14-inning win in Miami, struck out with runners on the corners. • Franco tied the game with a two-run homer against Noah Syndergaard in the bottom of the fourth. The Mets went ahead a solo homer by Brandon Nimmo against Jose Alvarez in the sixth. 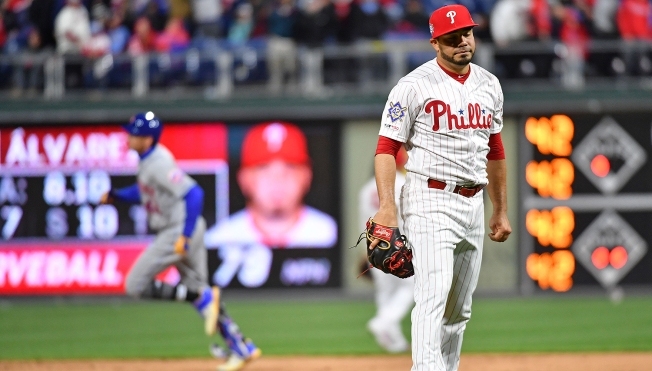 The Phillies' ace, coming off a season in which he pitched a career-high 212 1/3 innings, has not looked particularly good in any of his four starts. Sure, he pitched six innings of two-hit, one-run ball on opening day, but he walked five batters in that game. Nola lasted just four innings in this one. He gave up seven hits, three walks and five runs. He has given up four or more earned runs in three of his four starts this season. By contrast, he gave up four earned runs in just four of 33 starts last season. Nola's fastball is down a smidge from its average of 92.7 mph last year and his off-speed stuff is not as sharp as it was last year. Nola's biggest issue has been the lack of his typical pinpoint command. He has walked 11 in 19 1/3 innings. That's over five batters per nine innings or double his career mark entering the season. Nola's command issues also show up in his inability to fill the zone with first-pitch strikes. He threw a first-pitch strike 69.4 percent of the time last season, second best in the majors to St. Louis' Miles Mikolas. This season, Nola has thrown a first-pitch strike just 47 percent of the time. Nola's ERA after four starts is 7.45.